Cryptozoology is the investigation of animals not yet recognized by science, but whose existence is hinted at by eye witness accounts, photos, or traces. 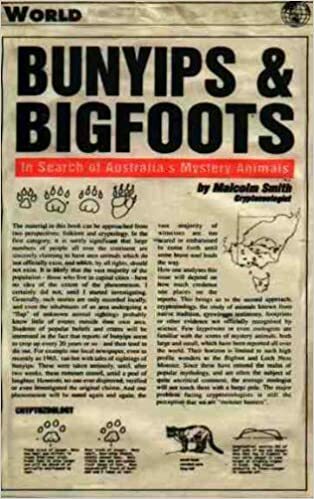 I provided a major review of Australian cryptozoology in my 1996 book, "Bunyips and Bigfoots". This blog aims to continue reporting on that research. However, initially, I intend to provide a service of translating into English a number of foreign language accounts from around the world. The best documented Australian "sea serpent" was an elongated, inquisitive mystery animal which frequented Deception Bay in the period 1959/60. Situated at approximately 153° 7' E, 27° 9' S, not far north of Brisbane, Queensland, Deception Bay is a sub-section of Moreton Bay. Roughly semicircular in shape, it is bounded on the south by Scarborough, the northernmost part of the Redcliffe peninsula, and on the north by Bribie Island. I can never hear the name, Deception Bay without thinking, "monster" because the first time I heard about it was in relation to the monster, not long after I moved to the Brisbane area as a boy. In December 1996, I was on talkback radio promoting my book, Bunyips and Bigfoots. When the compere referred to the section on the Deception Bay monster, a Mr Mick Scheirupflug phoned in to say that he also had encountered a strange animal in the bay. One thing lead to another and, that evening, I was able to interview all three witnesses independently by telephone. Matters of Agreement. All three agreed on the basic details. Several decades before, Mr Scheirupflug, his son, and young friend had hired a boat in order to fish for whiting in the bay. The creature surfaced not too far away, and was in view for a few minutes, moving parallel to them. It was a slim, serpentine animal consisting of a series of humps, but with no fins. They had difficulty describing its motion but, after some probing, but not leading, questions they all agreed it moved by vertical undulations. They also all agreed that it finally slid forward into the water and disappeared. They did not mention it to anybody else. Now for the individual stories. First Witness. Mick Scheirupflug, retired carpenter, aged 77 in 1996. He was vague about the year, but suggested it was about 20 years before. Then his wife chimed in and said it was more like 30 or 40. The event took place about half past 8 in the morning, about half a mile from Scarborough, where the water was only about 10 or 20 feet deep, and calm. The boat was stationary, and the animal about 150 yards away. The sighting lasted 4 or 5 minutes. It was pale brown, mottled like a carpet snake. He thought there were three humps, protruding a couple of feet out of the water, with a total length of well over 20 feet. He could not remember seeing any head or tail. Second Witness: Peter Scheirupflug, son of Mick, aged 49. As the youngest member of the party, his memory was the weakest, and required a lot of prompting. He told me that afterwards, they convinced themselves they hadn't seen it. He thinks he was aged 10 or 11 at the time. The time was about 2 pm, and they were drifting about 2 km from Scarborough, the water being very calm. The sighting lasted 4 or 5 minutes, at a distance of 300 to 350 yards, and "we didn't want to get any closer". He was uncertain about the colour, perhaps greenish grey. There were two humps, as thick as a man's thigh, say 200 mm (8 inches). The head was not much bigger than the body, but he could not see much detail. The length of the head and two humps would have come to 9 or 10 feet. Third Witness. John Willett, aged 55, Mick's son-in-law. He provided a quite different account of the circumstances. It was at least 35 years before. He said that the sighting occurred in the afternoon, and that they were halfway across the bay, and had decided to head home because the weather had turned rough and windy, with light rain. He contested the statements of the other two, and said he distinctly remembered putting his head down against the wind, and also remembered the sea being choppy. The animal appeared only 20 or 30 feet away. I asked him twice. He was sure it was close because the water was bad. The sighting lasted 1½ to 2 minutes, and they were scared. He mentioned that the animal was moving parallel to them, but in the opposite direction ie north. The motor had probably disturbed it. He distinctly remembered three humps, and possibly four, and they were quite distinct despite the very rough water. They were at least a foot in diameter, the distance along the tops of each hump being about 5 or 6 feet, and the space between the humps 3 or 4 feet, making a total length of 20 to 30 feet. He couldn't remember the colour. However, he did say the head was like a snake's or eel's and, whereas the other two failed to see any tail, he volunteered, without being asked, that he saw the tail come out of the water just before the animal submerged. It was like a very large paddle, flat and horizontal - unlike a fish's vertical tail - and was not forked. He described its motion as like a snake sliding over three rocks. The body itself did not move up and down i.e. there were no coils, but the humps moved with a fluid motion. Comments. After such a lapse of time, the variations in the accounts are not surprising. Indeed, this makes them all the more valuable, by demonstrating that the witnesses' memories have not been altered by telling and retelling the story among themselves. As far as the circumstances of the sighting, I am inclined to put more credence on the third witness. The other two were probably recalling the weather at the start of the excursion. Also, although he has probably underestimated the distance, his estimate of the duration of the sighting is probably more accurate, seeing that the animal did not apparently get too far away. Besides, you can see a lot in 1½ to 2 minutes, if your adrenaline is pumping. Nevertheless, it is clear that the three descriptions are all variations on a theme. Readers of cryptozoology will no doubt be aware that vertical undulations, with or without a horizontal tail being visible, are only referable to mammals. They will also be aware that elongated, multihumped creatures are well represented among "sea serpent" reports. One is immediately reminded of "Caborosaurus", the sea serpent of the narrow waters around Vancouver Island on the other side of the Pacific. When did it take place? Unless a witness has some circumstance or event to "anchor" a sighting, it is very difficult to remember exactly when a sighting took place. Therefore, I am more inclined to accept the estimate of Peter, who was just a young boy at the time. While the lives of adults tend to be routine, those of children are constantly changing with respect to school and social life. So if Peter said he was 10 or 11, it is unlikely he was as young as 7 or 8, or as old as 14 or 15. Taken at face value, this would place the unreported sighting about 1958 or 1959 - just before the much better publicised Deception Bay "monster" of 1959-60. I find that amazing! Not only that, it appears to have been a different kind of animal. The later, better documented one had a larger head and a heavier body. Indeed, one of the witnesses I spoke to emphasized that it was not really serpentine in form, just elongated and thickset. Not only that, but a couple of years later, a totally different kind of "sea serpent" - the classic long-necked, bulbous-bodied type - turned up off the coast of the nearby Bribie Island. Something was drawing these strange denizens of the sea to this very restricted area of water. I hope they decide to come back while I am still around! Based on what you've written here Malcolm I've just googled 'deception bay australia webcam' in the hope there might be one pointing out towards this highly promising monster hotspot. Alas motorways aplenty but nothing focused out on the bay itself. Wouldn't such a cam make an excellent but cheap device for promoting tourism in the area especially if someone saw something? It's an idea. However, since the bay is 8 miles wide, and there have been no further reports for the last 50 years, I have my doubts. I am pleased to provide a link to a website of a friend of mine, Robyn Tracey, who has written a fascinating story about her dealings with brush-tailed possums in the outer suburbs of Sydney. You can download the book for free, or read it on the site. Go to: The Possum Book. There are still a few copies of this book available. Click on image for full details.